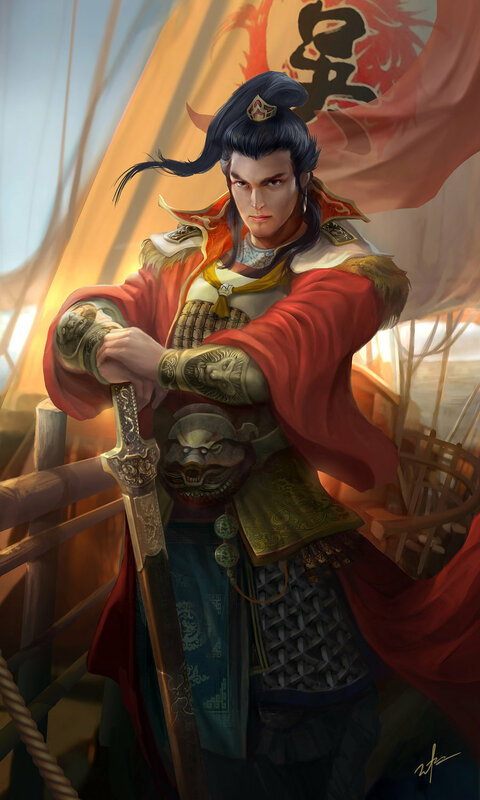 Captain-at-Arms Wu Yuntai: AC 1 (unarmored), Lvl 8 elf (in other D&D versions a Fighter/Magic-user Lvl 8/8), hp 36, MV 120’ (40’), AT 1 sword +1 (right hand, expert proficiency), Dmg 2d8 sword, Size M—Str 16, Dex 14 (Agt 14/Dex 10), Con 15, Int 16, Wis 13, Cha 12, ML 11, Saves as fighter, NP 4*, AL Neutral (“Lawful Neutral” in other game versions). Faith: none established. Credentials: none. Apparent Age: mid 30s. 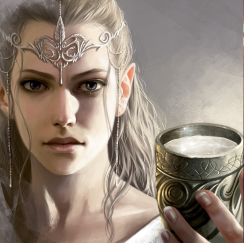 Ancestry: elven; unknown origins. (*) NP: see note on Notoriety Points in the previous article. Magic-User Spellcasting—L1 x3, L2 x3, L3 x2, L4 x2. General Skills—Set #1 Army Commander (no penalty) incl. Bravery (Wis), Horse Riding (Dex), Intimidation (Int), Knowledge of Palace Intrigue (Int), Leadership (Cha), and Military Tactics (Wis); Individual Skills incl. Alertness (Dex), Knowledge of Falconry (Wis), and Quick Draw (Dex). Weapon Proficiencies—basic proficiency with dagger, longbow, and staff; expert proficiency with sword. Commander’s Rating—(14) Good (see Skyship Saving Throws). Equipment: Breastplate of defense AC4, sword +1/+3 vs. dragon kin, ring of protection +2 (holding his hair), rod of bolts (1 charge), potion of healing. 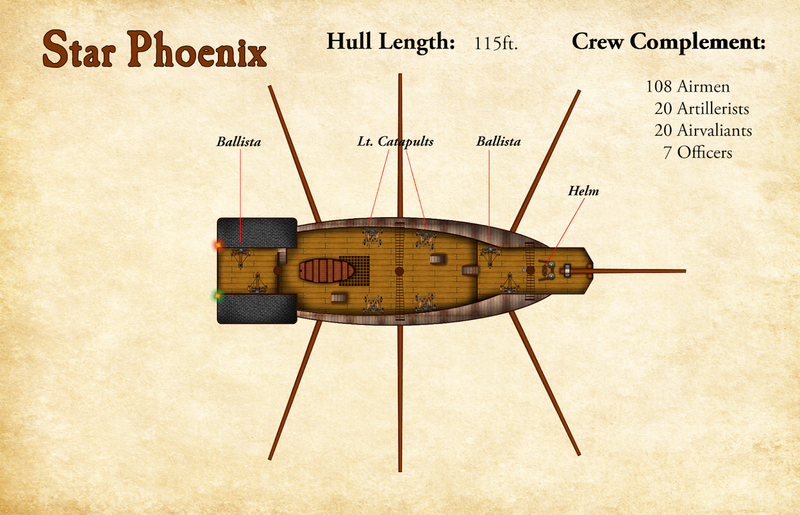 Rod of Bolts: This weapon is a standard piece of equipment for marines aboard the Star Phoenix. The ship’s artificer is responsible for recharging these items after they are used. Each can release one half-strength lightning bolt (thus, 3d6 damage per bolt) per encounter. Although rarely true, as many as 20 marines (also referred to as “airvaliants” in Meryath) make up the ship’s full complement, plus their commander. A squad of a dozen is more common, often split between the ship’s fore and aft sections. A full concentrated broadside can be devastating, however, marines are trained to avoid aiming at the same point—rather, their bolts typically fan out in order to stop an enemy crew from boarding. Once the rods are discharged, marines revert to normal swordfight. The rods almost never receive more than a charge each to limit damage should one fall into the wrong hands. Marines are personally responsible for their rods, and are instructed to destroy them if at risk of being seized by an enemy. Airvaliants (11-19): AC 6 (leather), Lvl 2 fighters, hp 10-12, MV 120’ (40’), AT 1 sword or bolt, Dmg 1d8 sword or 3d6 bolt, Size M, ML 10. Weapon Proficiencies: sword, dagger, pike, light crossbow. Sergeant-at-Arms (1): AC 3 (chain mail), Lvl 3 fighter, hp 20, MV 120’ (40’), AT 1 sword +1 or bolt, Dmg 1d12 sword or 3d6 bolt, Size M—Str 16, Dex 13 (Agt 13/Dex 9), Con 13, Int 10, Wis 11, Cha 12, ML 9, AL Neutral (or “Lawful Neutral” in other game versions). Faith: Istra*. Credentials: none. Apparent Age: early 40s. 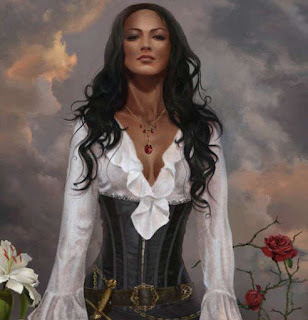 Ancestry: Human; Meryath. Weapon Proficiencies: basic proficiency with dagger, pike, and light crossbow; “skilled” proficiency with sword. (*) +1 to hit vs. Draconic knights. 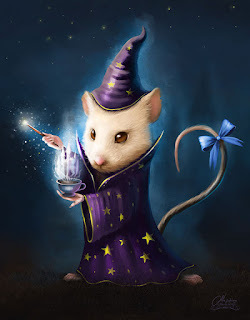 Master Artificer Ebben Rugwittle: AC 5 (unarmored), Lvl 9 magic-user, hp 23, MV 90’ (30’), AT 1 dagger +1 (right hand, expert proficiency), Dmg 2d4 dagger, Size S—Str 11, Dex 17 (Agt 14/Dex 15), Con 12, Int 17, Wis 10, Cha 13, ML 10, Saves as magic-user, NP 2*, AL Neutral (“Chaotic Neutral” in other game versions). Faith: none established. Credentials: none. Apparent Age: late 40s. Ancestry: gnomish; unknown origins. (*) NP: see note on Notoriety Points in the previous article. Magic-User Spellcasting—L1 x3, L2 x3, L3 x3, L4 x2, L5 x1. General Skills—Set #1 Skyship Engineer (no penalty) incl. Knowledge of Machinery (Int), Knowledge of Physics (Int), Skyship Engineering (Int), Ship Building (Int); Individual Skills incl. Craft (Weaver, Int. ), Craft (Seamster, Int), Profession (Ship Chandler, Int). Weapon Proficiencies—basic proficiency with sling; “expert” proficiency with dagger. Commander’s Rating—(13) Good (see Skyship Saving Throws). Equipment: dagger +1/+3 vs. incorporeal beings, shoe buckles of defense AC6, ring of catnapping (20mn of sleep count as a full hour of rest). Effect: Refills depleting magical items. This handy spell enables the artificer to restore spent charges to certain magical items, such as wands, staves, rods, and others previously devised to require charges. The artificer must memorize the original enchantment’s spell. The restoration then duplicates the memorized spell’s effect, restoring charges to one item or distributing them to a group of identical items in close contact. The number of duplicated charges is equal to the artificer’s experience level divided by the memorized spell level (round up). When done, both the source and restoration spells are used up. Ship Artificer Rugwittle restores charges to the marines’ rods of bolts, revitalizing 3 items per spell (up to 9 per day conceivably, more if the DM allows trading a higher level spell for a lower level one). To remain “legit” with established rules on enchanting magical items, the cost of recharges still remains in force. This includes spell components or, in Rugwittle’s case, Oil of Seith, which can be substituted for normal ingredients in the Calidar universe (see CC1 “Beyond the Skies” for details on Seitha, page 205). This oil takes up less space than common spell components, a desirable quality within a skyship’s limited confines. Coincidentally, the cost of Seitha is exactly the same as what established game rules suggest (see Rules Cyclopedia, page 252). Effect: Restricts an object’s movement. This spell is part of the enchantment process of a sailing skyship’s hull. It helps restrict its movement to its hull’s centerline, without which the skyship would otherwise drift with the wind. The movement restriction isn’t absolute, attesting to the fact that sailing skyships do drift to some degree, depending on the strength of cross winds, much like a seagoing vessel. The spell can be cast on any single object with the same effect. The artificer determines exactly along what axis the recipient should move. For example, if cast on a sword, it could to made to move freely in a direction aligned with its blade. Physical strength would otherwise have to be applied to alter its direction (which would be the function of the helm on a skyship). Any single point of Strength can either rotate an Azimuthal Lock +/– 10˚ or push the recipient sideways by a foot, per hour. So, 10 characters with an 18 Strength would need six minutes to rotate it 180˚ or push it 18’ sideways (+/–5˚ per combat round or 6 inches sideways). Perfectly ridiculous but it’s fantasy so get used to it. In the first of the articles intended to convert Star Phoenix crew members to D&D BECMI, I had detailed Captain Isledemer d’Alberran. Here’s the shyship’s first mate, Enna Daggart. 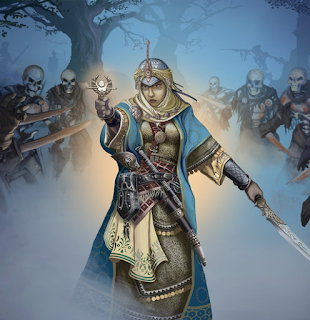 She was first described in CAL1 “In Stranger Skies,” page 110, for Pathfinder. If you haven’t read the first article, click here for details, and familiarize yourself with Calidar’s peculiarities. Reminder: weapon damage listed here reflects the Weapons Mastery Table (Rules Cyclopedia, pg. 78-79). First Mate Enna Daggart: AC 4 (unarmored), Lvl 9 swashbuckler, hp 50, MV 120’ (40’), AT 1 cutlass +1 (right hand, master skill), Dmg 3d6+3 cutlass, Size M—Str 14, Dex 15 (Agt 15/Dex 12), Con 15, Int 15, Wis 14, Cha 14, ML 10, Saves as fighter, NP 3*, AL Neutral (or “Lawful Neutral” in other game versions). Faith: none established. Credentials: none. Apparent Age: 30s. Ancestry: human; unknown origins. (*) NP: see note on Notoriety Points below. General Skills—Set #1 Airship Commander (no penalty) incl. Aerial Navigation (Int), Leadership (Cha), Piloting (Dex), Deck Weapons (Int), Skyship Tactics (Wis), and Weather Sense (Wis); Set #2 Swashbuckler (–2 penalty) incl. Acrobatics (Agt), Alertness (Agt), Bravery (Wis), and Quick Draw; Individual Skills incl. Bargaining (Cha), and Horse Riding (Agt). Weapon Proficiencies—basic proficiency with daggers, light crossbows, and ballistae; master proficiency with cutlass. Commander’s Rating—(16) Expert (see Skyship Saving Throws). Equipment: Cutlass +1/+3 vs. sea & sky pirates, bracers of armor +3, earring of airmanship (+2 bonus to basic sailor skill checks), two-way scroll of communication (connected with Capt. d’Alberran’s), potion of healing. Ship Master Arabesque Starward: AC 2 (armored), Lvl 9 cleric, hp 35, MV 120’ (40’), AT 1 barbed spear +2 (right hand, “skilled” mastery), Dmg 1d6+3* spear (20/40/60), Size M—Str 12, Dex 16 (Agt 13/Dex 16), Con 11, Int 14, Wis 17, Cha 16, ML 10, NP 3*, Saves as cleric, AL Lawful (or “Lawful Good” in other game versions). Faith: Istra (Meryath). Credentials: none. Apparent Age: 30s. Ancestry: elven; unknown origins. (*) NP: see note on Notoriety Points below. (**) The spear’s barbs do an extra point of damage. Clerical Spellcasting—L1 x3, L2 x3, L3 x3, L4 x2. General Skills—Healer Set (no penalty) incl. Alchemy (Int), Herbalist (Int), Healing (Int), Knowledge of Poisons (Int); Navigator Set (no penalty) incl. Aerial Navigation (Int), Leadership (Cha), Mapping/Cartography (Int), Weather Sense (Wis); Chaplain Set (–2 penalty) incl. Ceremony (Wis—Istra), Persuasion (Cha), Singing (Cha), Storytelling (Cha). Weapon Proficiencies—basic proficiency with sword, longbow, dagger; “skilled” proficiency with barbed spear. Commander’s Rating—(15) Good (see Skyship Saving Throws). Cult Symbol—red hibiscus on a hand-size silver disc, usually worn as a medallion. Cult Benefits: +1 bonus to attack rolls and damage against hated foes; Sacred Animal—Kiwi or giant kiwi. Equipment: Barbed spear +2, chain mail +2, bezoar stone (+2 bonus to Alchemy skill checks when making poison antidote), potion of healing. Faiths in Calidar: Particular attention was paid to the costs and benefits of divine faith. CC1 “Beyond the Skies” brings to life scores of gods, organized pantheons, their historical timelines, and ancient legends. It details how this affects cult followers and their clerics. A key feature is the Divine Favor, a single-use magical feat granted to the faithful proving worthy of their deities’ trust. Displeasing a godly patron may also result in a Divine Wound. CC1 spells out much about the interactions among deities and between rival pantheons, defining motivations and politics among clerics, temples, and orders of knights—and therefore, how to role play characters, from unrepentant heathens to fanatical zealots. Arabesque’s Hated Foes are just an example. Though Calidar features gods, they are in many ways similar to the D&D Game’s immortals. NP—Notoriety Points: They are a feature of the World of Calidar (CAL1 “In Stranger Skies,” page 86). The concept of Eternal Glory revolves around the general idea that one isn’t truly dead until forgotten by all, meaning that heroes never die while tales of their deeds are told in homes, taverns, theaters, or books. In other words, one might be thought to be immortal when achieving legendary status. The magic of Calidar springs from its World Soul. If an idea is strong enough, this World Soul can bring into existence such things as gods or the most horrid of creatures—all it takes is the beliefs of many. Legends can be most powerful on Calidar. One manifestation of this concerns heroes who, after reaching a certain Notoriety, become epic heroes or fabled scoundrels, and cease to age. If they progress even further, they may indeed attain demigodhood (or become demons). This philosophy is strongest in Meryath, an extravagant kingdom where the cult of heroes permeates much of its local culture, economy, laws, and politics. Indeed in the eyes of many an adventurer in Meryath, joining the Star Phoenix’s crew offers the prospect of quick Notoriety despite a life fraught with perils and probable death. Click here for the next two Star Phoenix officers. As regards Calidar's present Kickstarter, the announcement was made official about the next project to produce kits translating the series system-agnostic stats into the D&D Game's Fifth Edition (subject to copyright and OGL limitations.) Along the same line, additional kits may follow to accommodate earlier versions of the game, by way of existing OSR systems. These will be free PDF releases and/or low-cost POD booklets. This article continues from Pt. I, addressing holy symbols and magical wands as personally attuned devices. Clerical Symbols: If the symbol is a weapon (a bow, a sword, a spear, a hammer, a staff, etc. ), then use the weapon guidelines in the previous article (click here). If the symbol is something else, the following guidelines apply instead. Immortal patrons or their more powerful servants typically provide these personal devices to worthy clerics. They enable their owners to focus the power of their faiths and engender a numinous manifestation in one of three ways. 1. Tower of Faith: The device is brandished toward one attacker. From this point forward, its owner's armor class and saving throws receive a bonus equal to the symbol’s magical rating against attacks from the targeted foe. Though it requires a combat action to invoke, this protection remains in power until the owner dismisses it, the foe is felled, or the encounter ends. 2. Lordly Supremacy: As above, the symbol must be brandished before the owner’s foes, which requires one combat action. Supremacy is comparable to turning undead, except it may be used against living foes with alignments directly opposite the owner’s, or against sworn-enemies of the owner’s faith. In the case of BECMI (which has only 3 alignments), use only against enemies of the faith or at the DM’s discretion. Foes are turned as undead with the same or higher number of HD. Add the symbol’s magical bonus to the turning score and to the number of HD turned. A “D” result destroys undead only; other foes drop to their knees and prostrate themselves in awe/fear before the cleric (player characters and monstrous beings are stunned instead). Unless some mechanics are in place to convert groveling foes, treat as a Charm spell. Supremacy can only be attempted once per encounter. Digital Art / Drawings & Paintings / Fantasy©2014-2018 FilKearney. Wands and Rods: Rods are much more uncommon than wands in this context, though they work like wands. Staves are considered weapons and should be treated as such. The personal device of a magic-user, such as the one Captain Isledemer d’Alberran carries, bears three main functions. 2. Deflection: A personal wand may deflect direct attacks like weapons do (see previous article for details). Used in this manner, the owner is considered having “Basic” combat skill; Expertise, Mastery, and Grand Mastery combat skills only apply to wands when deflecting spells (as opposed to melee and other ranged attacks). 3. Wizardly Dueling: Personal wands (and the more common dueling wands found in schools of magic) can be used within the context of non-lethal dueling, calling forth a combination of their owners’ moves and short range, instantaneous telekinetic effects. Maximum range is 30’ between the two contestants. A personal device does not use magical charges during wizardly duels. Each round, contestants secretly pick one of six moves and reveal their choices simultaneously. Cross reference these choices on the Wizardly Dueling chart below to determine which move succeeds. For example: “Dodge” vs. “Lunge” results in the “Dodge’s” success, the “Lunge” being entirely foiled. Moves are simultaneous, unless an “Initiative” result comes up; roll for initiative—the faster moves then succeeds (reroll ties). Both moves fail with a “Nil.” outcome. Colors are only for cosmetic effect (red is a defensive move, green is an attack). “NPC” moves are numbered to allow for random DM rolls. Certain moves require a specific follow-up maneuver. The move following a “Feint” must be an attack. The move following a “Lunge” must be a defense. An incorrect move following a “Feint” or a “Lunge” results in this move failing altogether (essentially a fumble). Called the Scorpion, a “Feint-Lunge-Parry” sequence is deemed a “master stroke” that will earn a +1 Prestige bonus if completed successfully. Called a Pixie Kiss, “Swish-Dodge-Flick” is another. Small attack with good chances of success. A risky but powerful attack to disarm. Advantage: Opponent must dodge on the next round to recover the dislodged wand. An attack knocking an opponent off balance. Both maneuvers cancel each other. Special Competition Rules: Among other rules that a DM could invent, it is generally accepted among Caldwen wizards that one must use all six moves before repeating one, or incur a –1 Prestige penalty. Another house rule among gentlefolk adds another penalty for using the same move twice in a row. Mandatory moves and attempts to complete master strokes imply that contestants might incur penalties either deliberately or unavoidably. Using ESP effects on a contestant is grounds for disqualification. Skilled: A wand owner who won at least 5 duels, or the holder of a Spellcraft License*. A skilled duelist wins tied initiative rolls (void if opponent is also skilled). 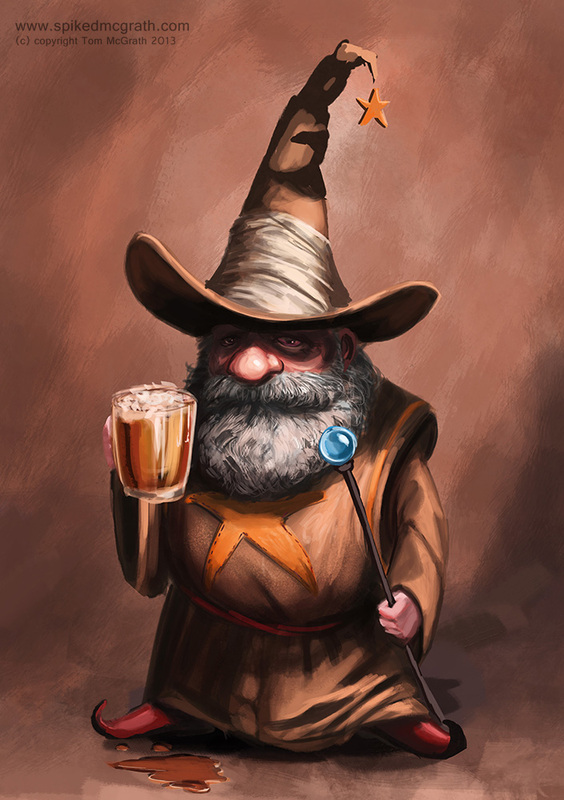 Expert: A wand owner with twice as many victories as defeats, or a Bachelor* alumnus. An expert wins all initiative rolls (void if opponent is also an expert). Master: A wand owner with three times as many victories as defeats, or a Master* alumnus. A master can combine two moves each round (unopposed attacks automatically succeed). Grand Master: A wand owner with four times as many victories as defeats, or a PHD* alumnus. A grand master always knows whether the opponent’s next move is an attack or a defense (void if opponent is also a grand master). (*) Diplomas obtained from accredited schools of magic such as those in the Magiocracy of Caldwen. Beyond Dueling: Taken out of their dueling context, the three attack moves can be used at any time as harmless effects available to wand owners up to a 30’ range, such as: “Flick,” which produces a flick of the fingers against a target; “Lunge” is equivalent to a poke in the nose, and “Swish” is a slap in the face, none of which inflict actual damage. On Wings of Darkness, Live!